The rate depends on the size of the air-craft used. Fill in our contact form for more details! The Great Blue Hole is nominated as the 8th wonder of the world by Virtual Tourist and defenitely a must-do while visiting Belize! 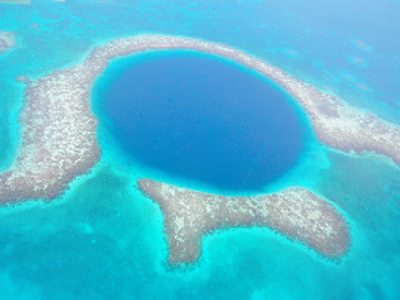 The Blue Hole is a large underwater sinkhole located near the center of Lighthouse Reef, a small atoll 62 miles from the mainland of Belize City. It is an almost perfectly circular hole with over 300 metres (984 ft.) across and 125 metres (410 ft.) deep. It is the world’s largest natural formation of its kind and it is the depth of water which gives the deep blue color.